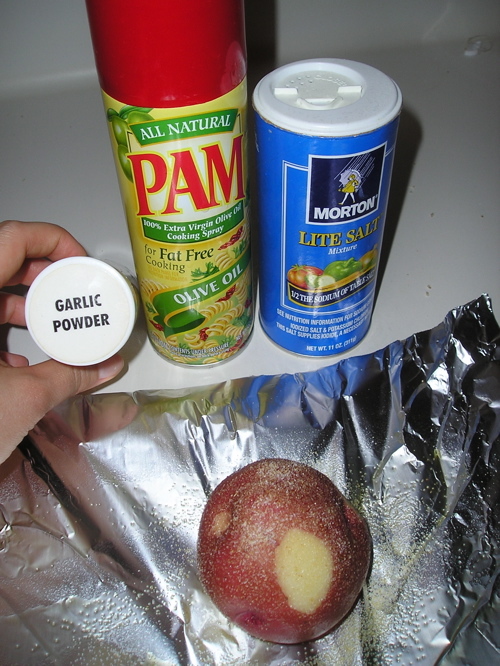 Put them whole or in large pieces on aluminum foil (more than one potato on the same piece of foil is fine). 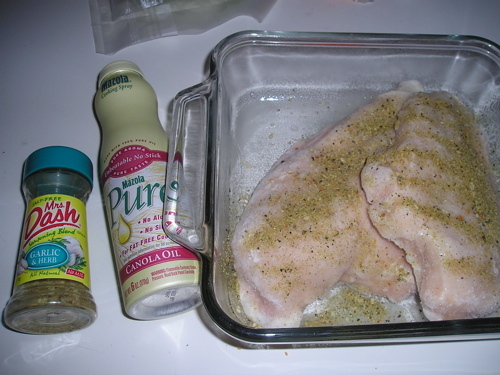 Season with salt and garlic powder. Wrap up the foil to make a packet (or packets). 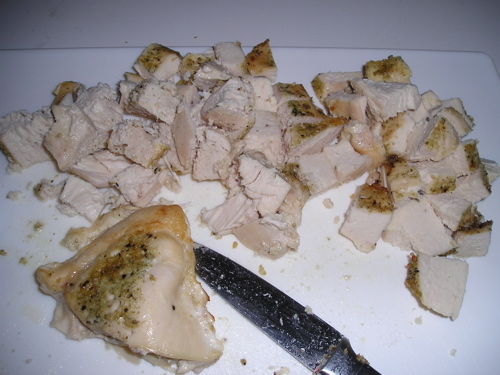 Put in the oven until tender (375 – 425 degrees). Unwrap and serve (or mash)! One of the things that I did to prepare for the school year was make posters. Yes, I already have a box full of posters, but I like making updated ones that I feel would work better with my students. I made reading response posters, journal starter posters, a scientific method poster, a poster with cover art from great books, etc. 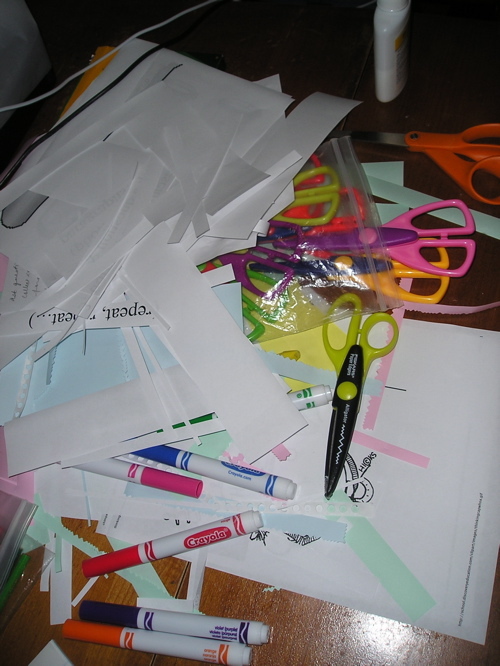 Here are some pics from working on some at home (note the mess involved). 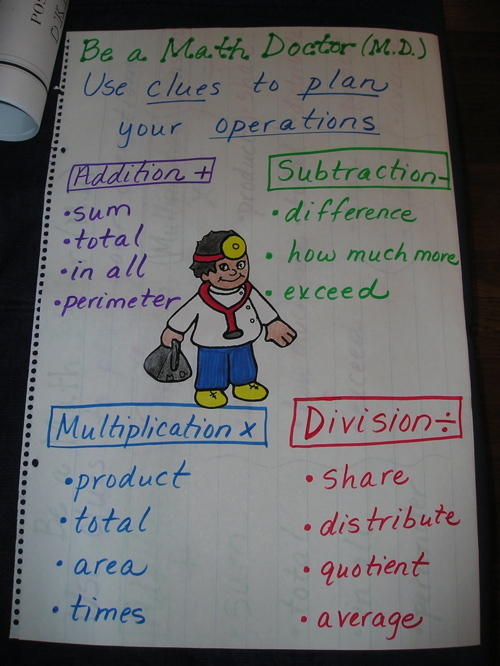 I ended up re-doing the math strategies poster, because the writing was too small to see across the room. 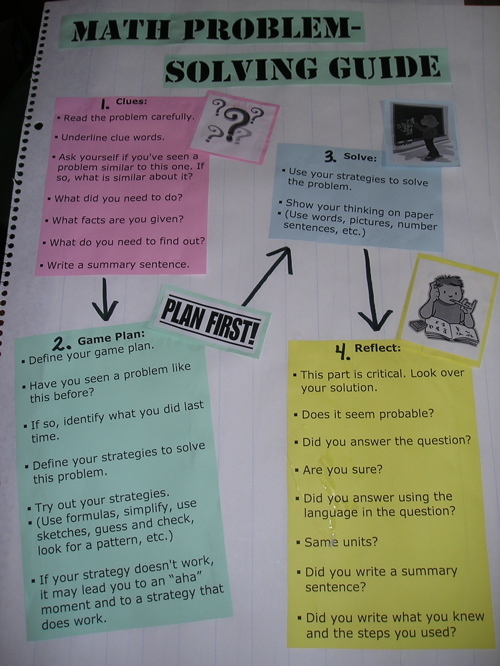 Now, it’s a simple poster of about 5 steps (something along the lines of: read the problem, plan, solve, reflect, write what you did). 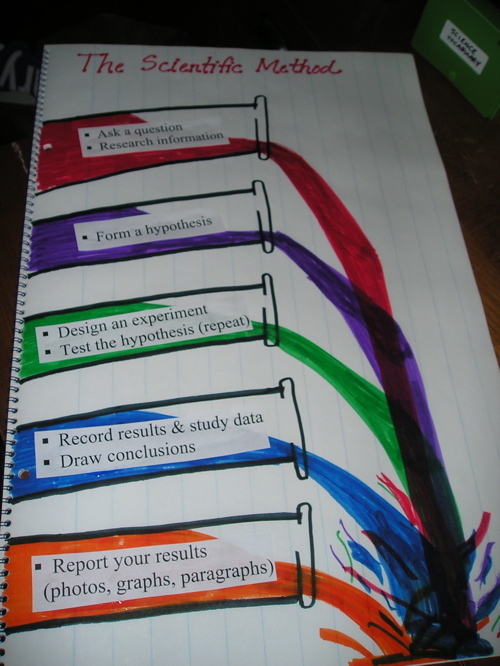 I may have to redo the scientific method poster (again), because it also is hard to read across the room. 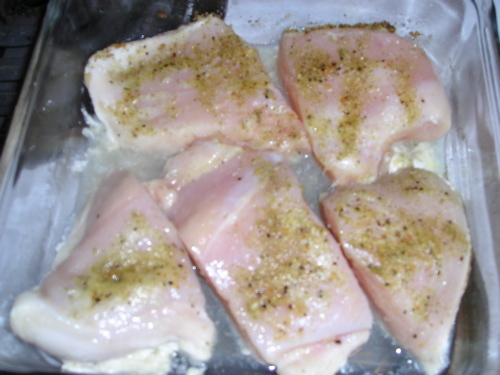 Thaw 4 oz tilapia per person (or use fresh). 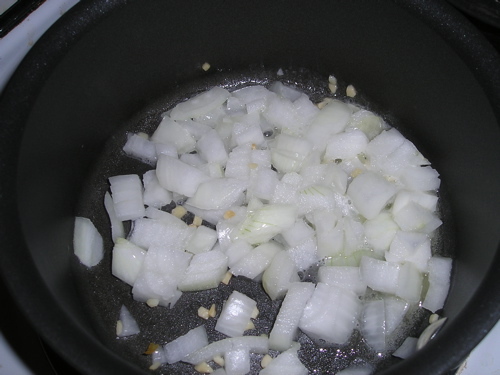 Heat a frying pan and add 1 tsp – 1 tbsp of olive oil or EVOO (more if necessary). 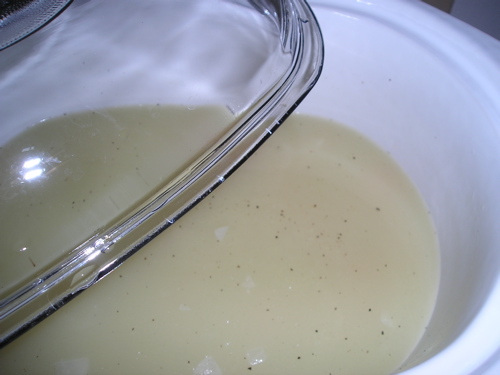 You can also use non-stick spray, butter, Smart Balance, etc. Add the fish to the pan. 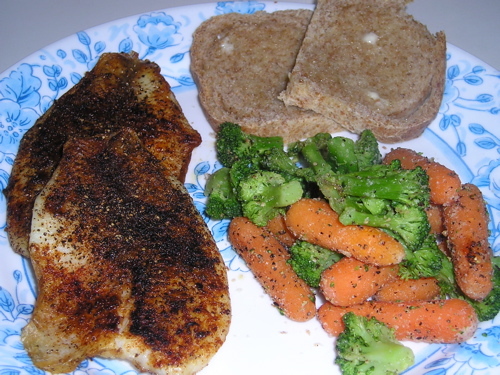 Season with salt, pepper, and paprika. 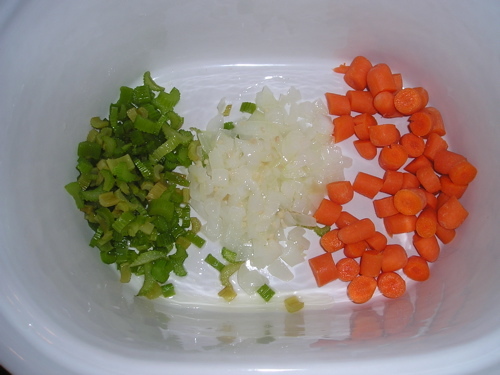 Cook for 3 minute on each side. 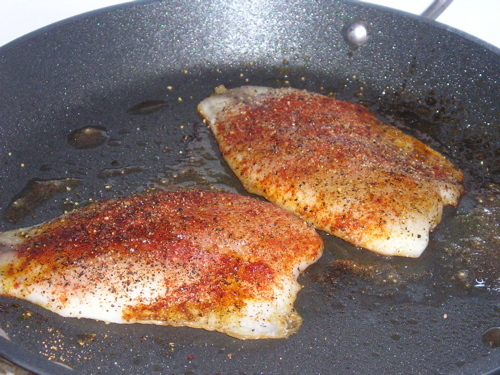 The fish should flake easily when done. It’s amazing what spurs you into action again. The trigger that moves you to drag out your training book and plan to exercise like a crazy person in order to do races again. I’m not sure if it was flipping through a Triathlete News magazine and seeing ads for races while going through my mail, or seeing the “Welcome Runners” and “Packet Pickup” signs down the street outside a fitness club, but something made me really want to do triathlons again! Recently, I tried jogging several times a week. It wasn’t enough for me. It’s just not the same to only jog. I must do triathlons. They’ve completely taken a hold of me, just like the souls in Stephenie Meyer’s The Host. I must swim, bike, run, and lift weights every week. I must have an upcoming race to be proud about, to tell my friends about, to look forward to with every what-am-I-thinking ounce of my slightly overweight body. Okay, so I’ve got September and October to find races and train for them. I prefer to do races in flatter parts of the state (they require a bit of traveling), so I’ll check in those places, as well as closer to home (hills = not fun). Swimming won’t be a problem (it’s the best part). I know that biking outside on my bike is just not going to happen on a weekly basis. I have a stationary bike. If I have to bike while eating breakfast or dinner, while knitting, while reading a book, then so be it. Yes, I know that everyone will end up passing me on the bike and running portions of my races, but what else is new? As for training, I know that I will train for a Sprint distance race. For those of you who don’t know about sprints, they usually involve swimming for 300-500 meters, cycling for 10-13 miles, and jogging 2-3 miles. Sometimes, the shorter versions are called Super-Sprints. In my training book (Tom Holland’s “The 12-Week Triathlete”), I have the option of training to finish a race or to improve my performance. The improving performance workouts involve speed work and longer workouts. I know that I can benefit (greatly) from speed work, but I have to consider my dear, sweet back. I think that gentler, shorter workouts (daily) will have a smaller likelihood of re-injuring my back. For those of you who are wondering, last year, I tried to do too much distance and too much speed while jogging. My back protested, and I ended up on prescription anti-inflamatories for my back (1-2 weeks). My training book has 12-week programs, and I obviously don’t have 12 weeks to train. If I do a September race, we’re looking at 2-3 weeks (you rest the week before). As I did a race in May, and I’ve been doing 1-mile jogs lately, I shouldn’t have much of a problem getting back into racing shape (the slow, but steady, triathlete – that’s me). I would like to add that part of my motivation for doing more races lies in wanting more race t-shirts! I feel that I got “gypped” in May, because I was given a ladies-fit t-shirt, because it was a ladies triathlon. If you’re overweight, ladies fit t-shirts, even larger sizes, cannot be worn out in public, unless you are in fighting shape. I’m sorry, but I have a gut (everyone always thinks that I’m pregnant, which I’m NOT!). Tight shirts, just don’t work on me. Of course, loose clothes don’t work either, because, as I mentioned before, everyone thinks that I’m expecting, especially if I’m knitting a baby blanket for a friend. Back to training. The 12-week workouts are broken up into the 4-week base phase, 3-week build phase, 3-week peak phase, and 2-week taper phase. I’ll be doing the build and peak phases. If I don’t do a race until October, then the 7 weeks of training will be just right. To all of my readers: Please cheer me on and check up on me! I need that “push” to keep it up!!! Last month, I wanted to make a month’s menu, but never got past planning one week at a time. Plus, I only managed to cook the first half of each week, because work was quite demanding of my time and desire to cook at home. I think my biggest challenges will be to cook at home on Thursday and Friday nights, especially if I have something going on in the evening (working late, volunteering, etc.). At least on Wed. nights, my Church provides dinner! This week, I managed (somehow) to plan meals for the entire month of September. Instead of posting everything at once, I’ll post each week, which will allow me to make minor changes as needed. Breakfast is usually a sandwich or cereal. 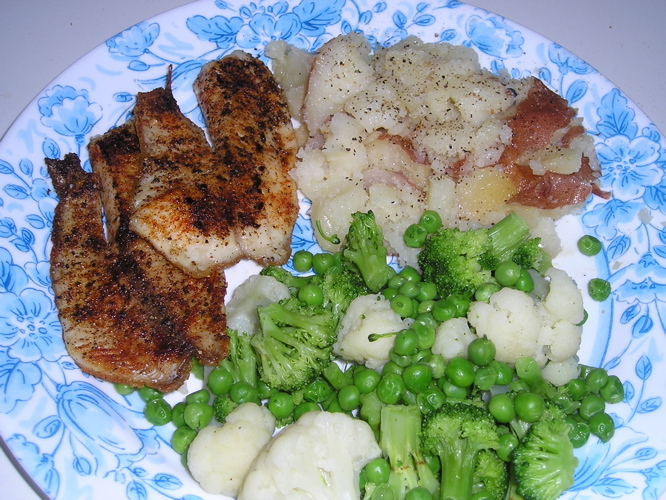 Lunches are usually sandwiches, leftovers, or frozen dinners. As you’ll see by my weekly menus over the coming month, many dinners will be repeated each week. Also, the majority of dinners are quick and easy to make. Yes, Hamburger Helper is on there frequently, because it’s quite convenient. I’ve also built in a few days of “Cookbook To Be Determined” days. If I’m not using those days to make up a dish that I didn’t get to make, I’ll consider trying something from one of my cookbooks. 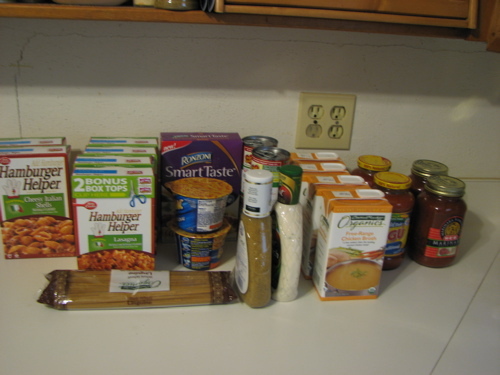 After I planned my September menu, I went to the store to purchase as much of what I would need for the month. I saw Owl Haven’s 30 Days of Nothing, which inspired me to plan my menu, buy what I would need, and see how I did eating as many of my meals from home as I could manage. Note, that I’m not doing the exact plan that Owl Haven is. Instead, I’m using it as a basis to eat at home more. You know that you eat out too much when a restaurant manager asks how the school day went! Anyways, I’ll still need to go to the store every now and then for fruits, veggies, and other perishables (plus ice cream, because I can’t be trusted to have too much of it in the house at one time!). I’ve budgeted for eating Wed. nights at Church. I also know that there will be some days when I’m so tired from work that cooking at home just adds to the stress level. When that happens, I’ll pick something up on the way home. Remember, my goal is to eat at home more, thus save money in the long run, but not to beat myself up if I eat out every now and then! 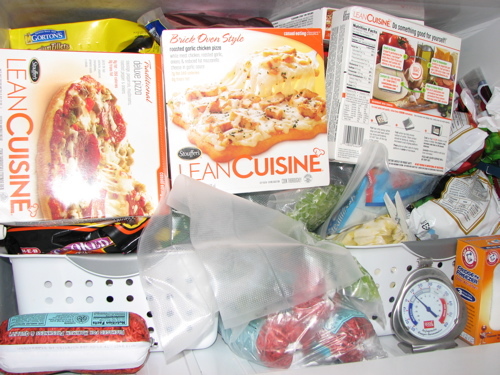 Here are some pictures of some of the grocery items I purchased, as well as my now-stuffed freezer. You know your freezer’s full when it takes two people to close it! 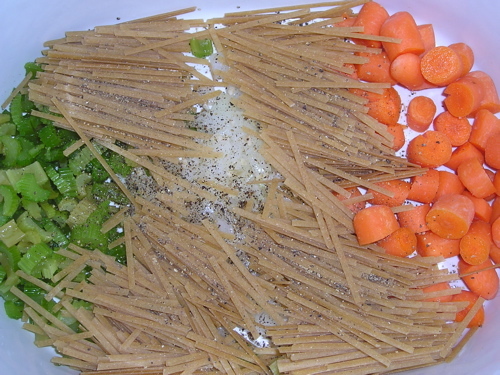 For more menu ideas, see orgjunkie.com. 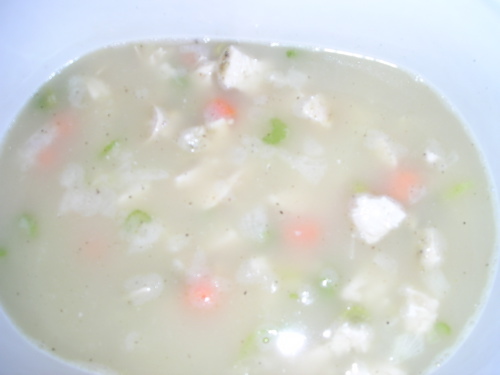 Last month, I made chicken noodle soup in a crockpot. 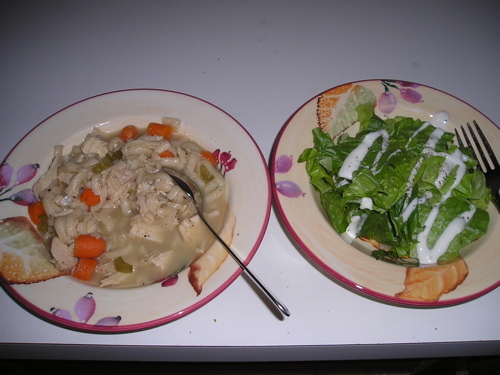 I had to cook the chicken in the oven and the onions on the stove, as well as add extra chicken broth to the crockpot. 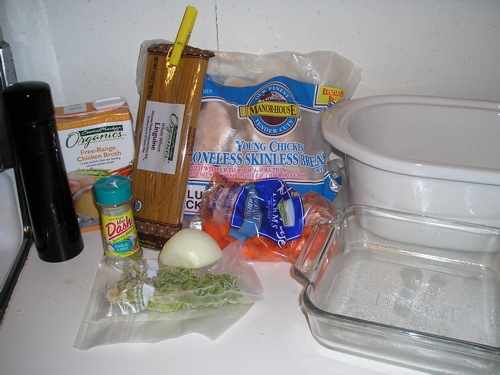 It takes longer than doing everything at once with the oven/stove, but if you’re away for the day, it saves you from cooking once you get home. Last week, I got through about half of my menu. I managed to cook up through Tuesday night. After that, things got a bit busy. On Wednesday, I ate at Church, which was delicious and convenient. Handbells are starting up again, so I won’t be cooking on Wednesdays for a long time. I worked 13 hours on Thursday and 11 hours on Friday. Both days, I left work (setting up my classroom), grabbed/ate dinner (Boston Market), and immediately went to bed. I’m moving the items that I didn’t cook last week to this week.